When Bass Are In A "Feeding Frenzy"
But It Doesn't Guarantee You'll get bit! Ah, fall bass fishing and the living is easy. What a great time of year. As the days get progressively shorter the air begins to cool producing crisp, calm mornings on the water. Mother Nature brings out her palette of colors and paints a beautiful picture for our enjoyment. Many will tell you that fall bass fishing is easy, a time of abundance. A time when your days on the lake will be nothing but "bass catching bliss". Cast out a hot dog smothered in mustard, ketchup, relish and onions and you'll catch bass. It makes no difference what you use for bait, they'll hit it. I don't know where the people who say this have been fishing but it sure hasn't been in my boat. Granted, bass are aggressive this time of year. They're hungry and feeding, anxious to build up energy reserves for the coming cold water months. That doesn't mean they lose all the instinct and "conditioning" that enabled them to live to see another winter. They may not be intelligent in the literal sense of the word, but their instincts and ability to develop "conditioned responses" to stimuli also means they're not "stupid" as that word is classically defined. What's this mean to you? Fall bass fishing can be great fun with fast action or incredibly frustrating if you don't understand the habits and instinctual urges of bass and the effect seasons have on them. Water temperature, which causes increased feeding activity in baitfish and bass. Types of forage in the body of water you're fishing, as bass will be programmed to react to natural forage and their movements. If and where there is any remaining "vegetation". Schooling bass and how to fish them. Solitary "stick-Ups" often hold largemouth lunkers this time of year. Don't pass up any without making a numerous casts to them. Keep in mind that smallmouth aren't as cover oriented as largemouth. In fall they will often be found holding in transition zones such as changes in shoreline or bottom structure and main lake flats. Fall Location Transition, What Is It? There are regional differences to the rate of water temperature change but "generally speaking" the following holds true. In the fall, as morning lake water temperature drops to 80 and below, the water's oxygen level goes up. This triggers increased feeding activity in bass. Baitfish also begin to "school" in open water as well as in the mouths of creeks. Once the water temperature reaches the 70's the shad will begin their migration into the creek arms. Why? Probably because the amount of nutrients in the main lake has been reduced over the summer. The water there also cools as sunshine duration decreases. Thus, the rate of growth of plankton, upon which the shad depend for food, declines. However, the shallow water in the back of creeks remains warm longer and there can be found the last plankton blooms of the year. Filter feeders like shad are drawn to this. As fall advances, the water temperature continues to cool. Often, frequent fall rains bring runoff to the back of creeks. This "moving water" serves as a "mixer" and introduces higher levels of oxygen into the shallow water found there. This will be higher than what is found out in deeper main lake water this time of year. This runoff also delivers additional small nutrients into the water which also feeds baitfish. Guess who is close by? With fall bass fishing the bass will be close by the migrating shad, so should you. Irregular weather patterns can bring cold weather one day only to see a warm day the next. An October night might bring cold air temperature as low as the high 30's to low 40's and drop the "surface temperature" from the 70's to the low 60's in one night. Does that mean the water temperature drops accordingly? No, most likely not. A few feet down the water will remain warmer and the bass will still remain deeper. Clear water lakes and reservoirs will cool at a slower rate than comparable stained bodies of water. In October bass may still be found in their summer pattern (deeper) in clear water lakes but already into the fall transition (movement to shallow water) in stained or murky water, as it cools faster. Surprisingly, even when fall rains bring colder water run-off into the back of creeks churning the water and making it muddy, you may find bass moving into this shallow water. Why? Because despite the murky conditions, the water is higher in oxygen levels than the main lake. Since the water in the main lake has greatly reduced oxygen after a hot summer this influx of "new water" filled with oxygen stimulates both forage and bass alike despite the murky water. So what does all this mean to you? It means bass will be feeding shallow, deep, and everywhere in between! It means the best locations for fall bass fishing will depend on temperature trends, time of day and types of available cover. It means bass will be moving! It means you must be moving too! Follow the forage. Find the bass. 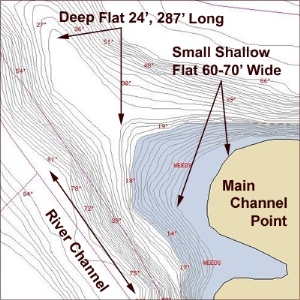 Shallow Flats, Backs Of Creeks Or Staging Areas In Deeper Water? After chasing "schooling" bass, which is often a hit or miss proposition, you will want to follow the forage into the creeks as they pull off the main lake and head into the creeks. First off, a good starting point is the back of the creeks! Look for bass where you found them last spring. Look for creeks that have inflowing water and multiple secondary points and banks lined with brush, stumps, standing timber, log laydowns and rock. If you find any vegetation in the back of a creek it's time to dance a jig! Your best chances of this will be found in major creeks toward the head of the river. Work outward toward the mouth of the creek. Secondly, an opposite strategy is to start at the mouth and main points of creeks and work toward the back. Here you may find baitfish schooling prior to entering the creek arm. Bass will be suspended close by attacking the shad. Additionally, you may encounter shad and bass off the main points of creeks as they're moving out of creeks toward deeper water in late fall. Thirdly, seek out main lake flats when fall bass fishing. 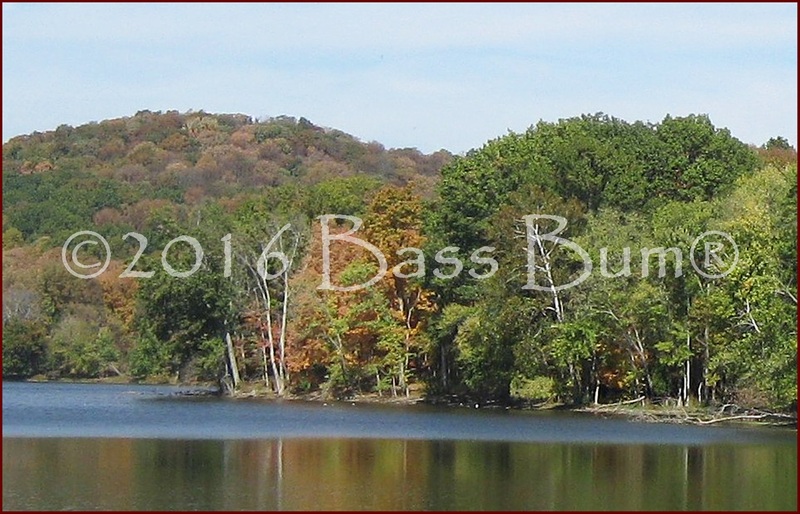 These are often the destination of fall baitfish and bass. Some bass, particularly smallmouth, will remain around such flats ambushing baitfish instead of moving into creeks. 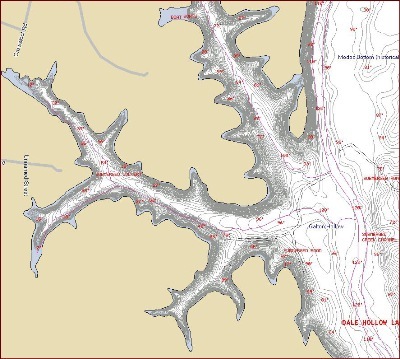 This is especially true if deep water is close by as shown in the map above where flats are adjacent to the main channel. The smallmouth will move up and down from shallow to deep throughout the winter months if they need to feed. Transition, that is, when bass move into the creeks, does not occur simultaneously across a lake. Normally, the upper regions will be the first to experience the drop in water temperature that triggers the transition. If the lake is large those bass in the middle portion of the lake may still be in their late summer pattern while those at the lower end may are still in their deep water summer patterns. Target your areas accordingly. 80-70 degrees Creek mouths, points in first third of creek, humps, rock piles Fish solitary wood with cranks, jigs, spinnerbaits and swimbaits. Topwaters too.